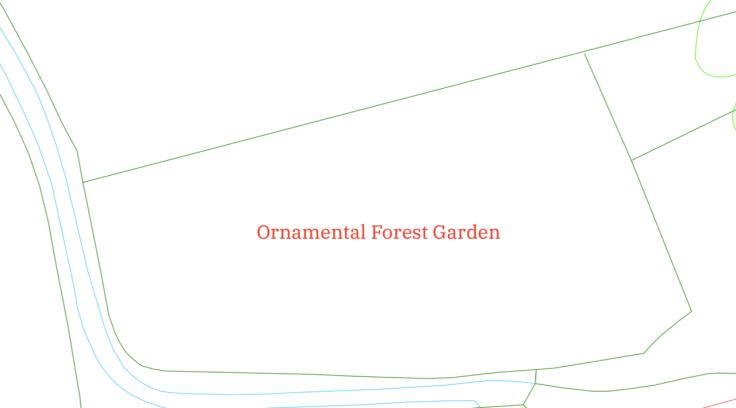 Oh, if only I could start planting the Ornamental Forest Garden straight away. But no. I need to survey the land before I make my Cunning Plan, before I get to the joy of planting. This is my current response, I just want to get the plants in the ground. But you can always pop the bare root new arrivals into a shallow trench until you are properly ready. And by properly ready, I mean that you have to have a plan. Plans are strange creatures, always bear in mind what the purpose of a plan is. In the words of Alfred Korzybski “The map is not the territory”. Don’t get too hung up on the precision of a plan, so long as it is good enough. 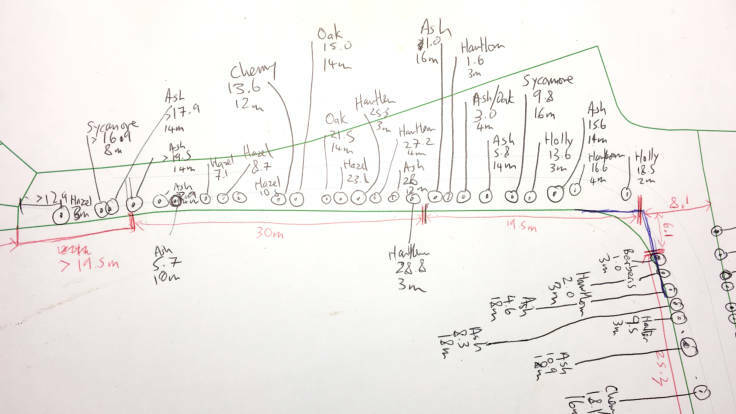 And for a forest garden, my main use of a plan is to calculate the final diameters and heights of trees, so I can ensure there’s enough light coming through the canopy. (A good rule of thumb is ¼ – ½ of the combined tree diameters). It’s faster and easier than marking out all the trees in the field. And as the saying goes, “Make the big mistakes early”. Another use of a plan, particularly when using CAD software, is that I can estimate the square metreage of an area really quickly, which is good for calculating the amounts required of sheet mulch, wood chip mulch, ground cover plants etc. Before a plan though, you need to survey the land. To save time, I am using an Ordnance Survey CAD map in DXF format which I bought online from The Map Centre for about £40. It’s not the most accurate of maps, so I have been measuring the lengths of the sides using a good old tape measure, and then cross-referencing the angle of the points (triangulating) using the Theodolite viewfinder iPhone app. There are plenty of simpler and lower-tech methods out there but alas I don’t have much time to explore the options. 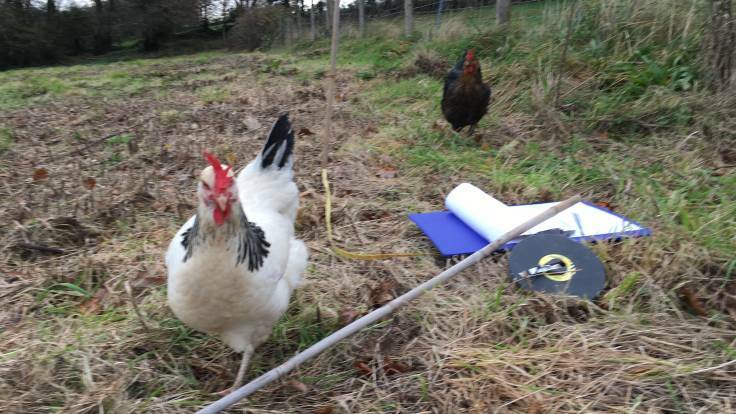 I would like to go to the introductory course Field Survey Techniques run by Aberystwyth University at Denmark Farm in March 2019. I also measured up the existing trees. We have about 80% ash trees, and Ash Dieback is quite literally just around the corner, so it’s good to know what we have on the boundaries. 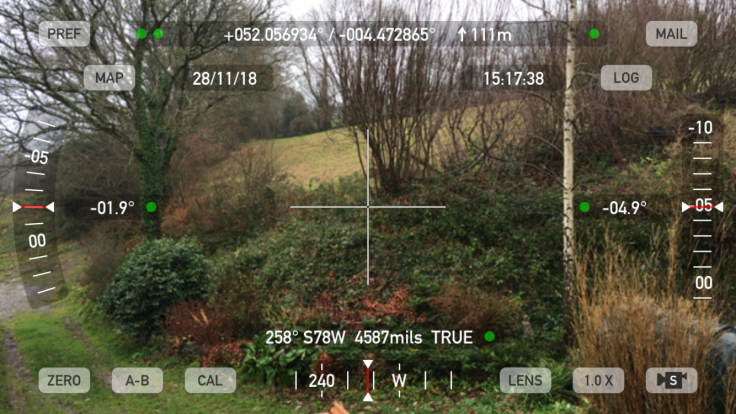 One of the handy features on the Theodolite app is, if you know the distance on the ground, the ability to easily calculate the height of the tree using the viewfinder and calculator. That’s a lot of trees in the hedgerows, supporting a lot of wildlife! The other surveying I’ll do is to test the soil at the local farmers shop (it will cost about £10). It should be similar to the adjoining field, ie a light clay loam with outcrops of bedrock, fairly acid and low in phosphorous. This way I can work out if I need to lime the soil to lower the acidity (I buy agricultural lime from a local quarry and transport it in a hired trailer). However, I’m not measuring the contours. There is a “bowl” in the sout east corner of the field, and the flattest bit across the top of the field where the tent and pond are going. But there isn’t really any need for any greater accuracy than that. Also, there are no power lines, telephone lines or other services that I have to consider, and no massively obvious water features (although it’s damper on the west side along the course of the old road).